$29.56 Winco MMPT-117 Tan Melamine Rectangular Platter 11-1/2" x 7-1/2"
$27.72 Winco MMPT-117W White Melamine Rectangular Platter 11-1/2" x 7-1/2"
Use the GET Enterprises ML-87-BK Black Milano Tray 17-1/2" x 6-3/4" to serve side dishes, appetizers and a variety of other delicious food. This tray features a sleek design with scalloped edges which adds a stylish flair to your food presentation. Made from break resistant melamine, this tray is exceptionally durable to keep up with the high demands of commercial use. 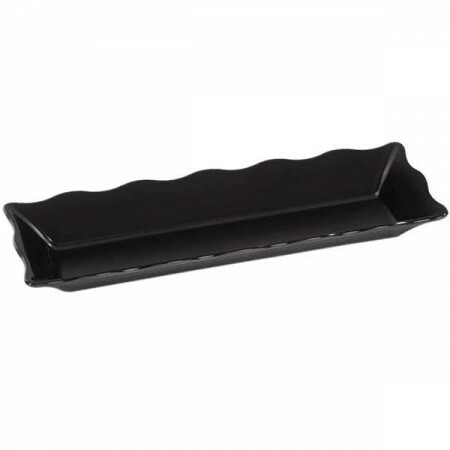 For easy cleanup and maintenance, this NSF approved black Milano tray is dishwasher safe.